I lived in Berlin for many years and I miss it a lot these days. It is, in my opinion, the most open and tolerant city in Germany. Everything is allowed. I loved its multicultural aspects, Berlin has got the biggest Turkish community outside Turkey. 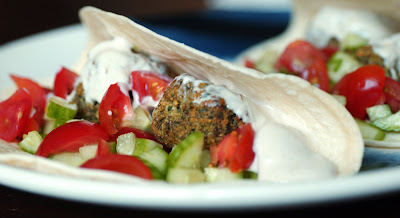 As part of that I learned to enjoy certain foods from there, in particular Falafel. However, Falafel can taste absolutely horrible when bought in the wrong place. In most snack points the Falafel is pre-fried and then heated in a microwave. The result is some very dry, tasteless something that is very hard to swallow. My favourite place for fresh Falafel was in Berlin-Mitte, in Grosse Hamburger Strasse opposite that hat designer shop (no clue if either of them is still there). Now I have been living in the Middle East for 5 years, and thought it was about time to do some Arab cooking myself at home. My Hummus attempts were pretty successful, so I dared to try some Falafel the other day. Soak the chick peas in lots of water overnight or for at least 8 hours. Drain the chick peas. Peel the onions and garlic and cut them into chunks. Wash the parsley/coriander and pull of the leaves. 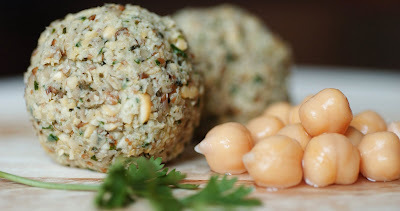 Blend chick peas, onions, garlic and herbs in a food processor. Season the pureed chick peas with the ground coriander, cumin, salt and pepper according to taste. Knead flour and baking powder into the mixture. Form little balls (size of a walnut) out of the dough. Heat lots of oil in a pan and deep-fry the Falafel balls for about 4-5 minutes or until golden brown. Put them on a kitchen towel and pat them dry afterwards. A healthier alternative is to bake them in the oven. Brush some oil onto the tray, so the Falafels will not stick. Place the tray in the upper third of the oven and bake at 250 degrees Celsius for about 15-20 minutes or until golden brown. Turn the balls halfway through. Mix the Tahini and the yoghurt and then add water little by little until you get some viscous consistency. Add salt for seasoning. Serve with and Tahini sauce and fresh tomatoes and cucumbers wrapped in Arabic bread or Tortilla bread.